It was bound to happen. I spent two whole posts bragging about our fabulous weather – heady heights of 23.6C – only for the heavens to split with sleet, hail and snow, all horizontal. And because we are also being teased with flashes of brilliant sunshine I am getting dizzy running around letting the hens in and out of their pens while the weather makes up its mind. But it’s better here than up north. Today in beautiful Aboyne, near Aberdeen, which last week set a record for warmest day in March, ‘Aboynians’ woke to six inches of snow, with more falling. That’s got to be a shock, especially for the tender plants just peeking through, and to the early spring lambs dotting the hillsides. And to anyone still in a bikini. Well, they are in Cornwall, apparently. Jammy so and sos. Luckily I adhere to the old English saying “ne’er cast a clout till May be out.” Translation: don’t put away your winter clothes until May finishes, and even then have it near to hand if you live in Scotland (that last bit is my translation). This morning I added to my standard hen-releasing outfit of pajamas and furry Crocs a goose down jacket, gloves, ski socks and a hat. You might think my hens are kept down a farm track, but no, they are all of 40 feet from my back door. I tell you, that Florida blood has a lot to answer for. And so this reawakening of winter means a lit fire, hot tea, restorative bars of chocolate, and soup. This soup. I know I swore off stews and deliberately rib-sticking stuff two posts ago when I was prematurely onto summery dips (Pea and Coriander Dip: Mock Guac), but today’s Caldo Gallego is a transitional soup, featuring spring vegetables, in a light but hearty tasting broth. So it will be perfect for any weather. Hopefully you are basking in the sun, maybe digging in your garden, perhaps eating your lunch on a sunny bench. Or at the very least not rescuing hens from sudden down-pourings of pea-sized hail. And so it continues. Tune in next time for a plague of locusts. I wonder what I will wear for that? Is your local weather crazier and more unpredictable than Scotland’s? Have you been breaking out the crockpot? Or, are you stoking up the barbeque? Amuse us/make us jealous/elicit our pity (and maybe a touch of schaudenfraude) with how your spring (or autumn for my Antipodean friends) is faring. I love your comments so don’t be shy. And so to chat about the soup. 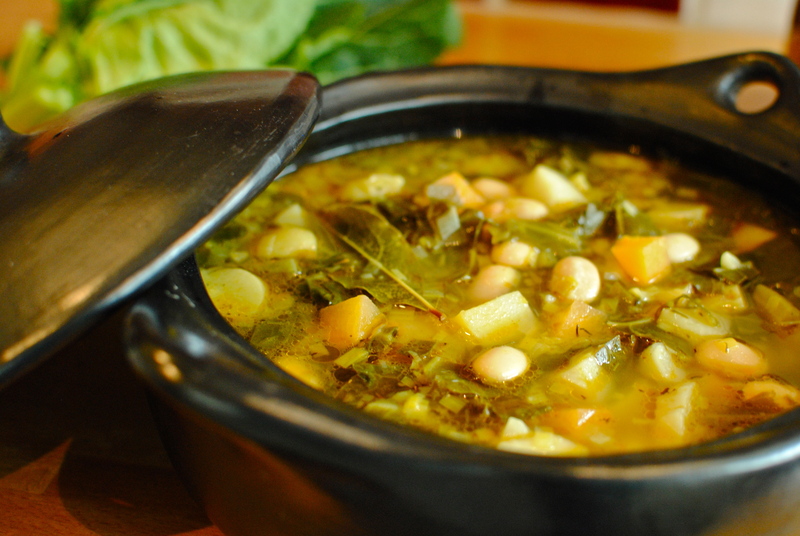 Although Gallego refers to anything from Galicia, a lushly agrarian area of northwest Spain, I associate this soup – caldo – with my Florida childhood. It used to be one of my favourite things to eat when growing up, and I became quite the little connoisseur. I lived just outside of Tampa, Florida, which has a large Cuban-Spanish population, and caldo gallego was on the daily menu of all of the Cuban and Spanish restaurants. Not that we ate out that often. Back in the 1970s eating out was still a special treat and not the everyday occurrence it is now for some. But if given the choice my vote would always go for Cuban food – for the sticky starchy plantains, inky black beans and rice, and always caldo gallego. I just loved the salty spicy taste of this honest soup, a real contrast to the often-bland offerings at American restaurants. While my sister might skip the starter, with her eye on getting a flan for afters, I would without hesitation, or reading the menu, always opt to start with good old caldo gallego. I can almost taste it right now. It is the taste memory that I have gone by to help conjure a healthier version of an old favourite. 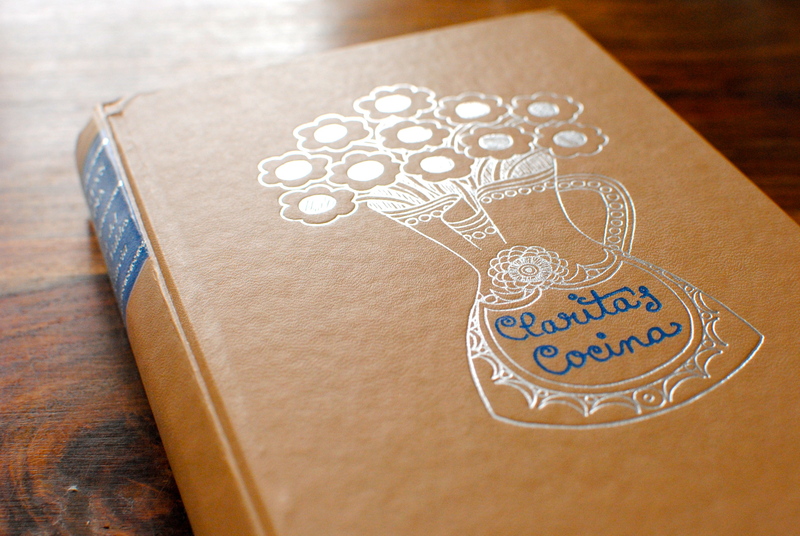 With a little help from Clarita’s Cocina, my mum’s old Cuban cookery book (1970 edition). There are many variations of this Spanish soup, but caldo gallego is traditionally made with a hearty (read ‘heart-clogging’) amount of various cured meats – ham hock, chorizo, salt pork. To be honest it is mainly meat, with a flavouring of greens and potatoes. 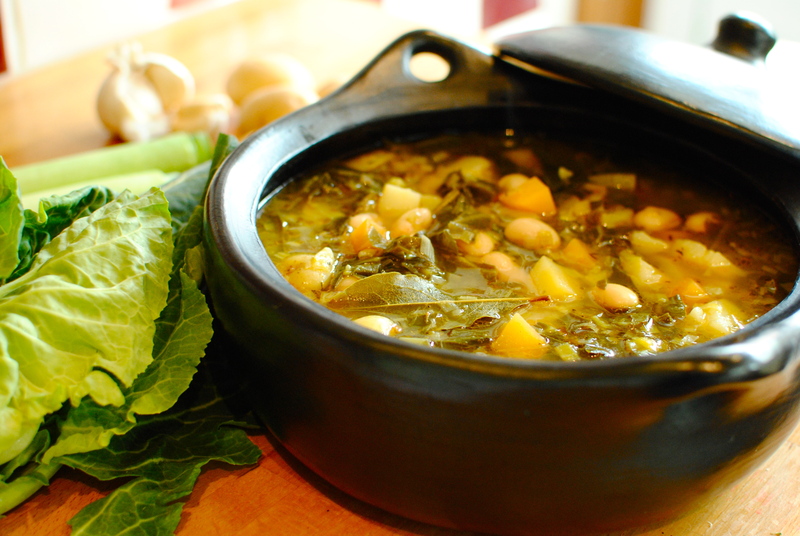 How, you may wonder, can anyone make this soup vegan? Isn’t meat the point of this dish? Well, I can’t say it is a dead-ringer for this northern Spain staple, but I think I’ve at least got the spirit of the idea with the seasoning. If you know caldo gallego you can perhaps judge for yourself how close I am to the real thing, but for the rest of you I hope you enjoy, without prejudice, this hearty and flavourful all-weather broth. I suggest a garnish of tiny-dice cooked pork or vegan chorizo, but I think it is fine without it. Your choice, as always. Miss R’s Cooking Track of the Week: El Sol de la Noche, by Cuban-Scottish fusion band, Salsa Celtica. Also check out this short documentary about Salsa Celtica. Outstanding, can’t-sit-still kind of music. 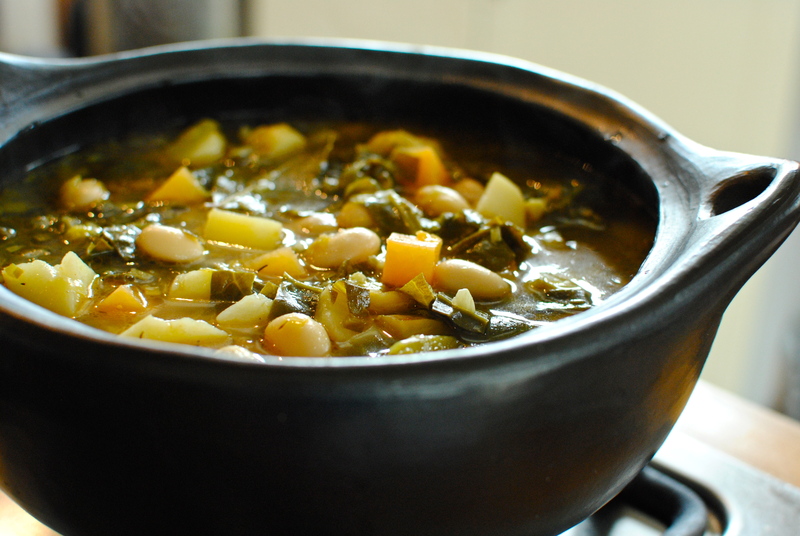 Not in any way, shape or form authentic, but this vegan version of the meat-tastic soup that is caldo gallego, should warm a few cockles with its savoury, smoky notes. Use any greens that you like – turnip greens are most authentic – but try and use what we over in the UK call ‘new’ potatoes: waxy, small potatoes that hold together when cooked. And maybe splash out on a small amount of best quality dried chorizo, for a sizzling and spicy garnish. Makes six generous servings – perfect for leftovers. Have a look at your greens and if they have thick ribs, remove these and dice quite small before slicing the leaves into long ribbons and then across to make pieces about 1-2 cm. You can really do it how you like but I find smaller pieces easier to manage, chewing-wise. Looks delicious. You’re pictures are beautiful!! Thanks for the Spanish recipe. Thanks so much! I love Spanish and Cuban food but living in Scotland means I pretty much have to make it myself. No bad thing, I guess. Arrrg the weather!!!!! but this recipe is just right for today in Edinburgh! Well this is just serendipitous then 😀 I will have to catch up with you in the Centre sometime soon. I hope you have pictures on your phone… I bet your trip was amazing and inspiring. Hope the weather cooperated. Crikey woman! Hope to see you before you are off again. Oh you are spot on about the weather! We’ve had a milder than usual winter without much rain. Then days of drenching downpours, and now sunshine in the high 60’s. Have no idea what tomorrow holds! Soup would be a comfort on one of those unexpected stormy days. Do much enjoy the added greens for color as well as healthy goodness. Thanks for commenting, Deb. Hope your weather settles down. It became lovely and bright and I was feeling like a moaner, but just now (while the hens are out) it has come a sudden sleety shower. Och well, as we say in these parts. Thanks for stopping by fellow wordpresser. My next recipe is going to be a crazy gluten free pizza that, with your blog title, you may be interested in – vegetables *as* the crust. This weeks veg box ingredients were made for this – well bar the potatoes so many thanks for providing something for my abundance of spring greens and a swede. Unbelievable weather!! However Christmas in Melbourne took some beating. A comfortably warm morning on Christmas Day meant lunch al fresco was planned. All was well until we sat down to a beautifully decorated table heaving with Christmas fayre and suddenly the clouds moved in, the temperature dropped and within 20 minutes hail the size of tennis balls was bouncing off the turkey. The kids thought it hilarious once we had retreated indoors! Well it is the city of 4 seasons in one day. New Year was spent in temperature of 42 degrees. This soup looks really Yummy! 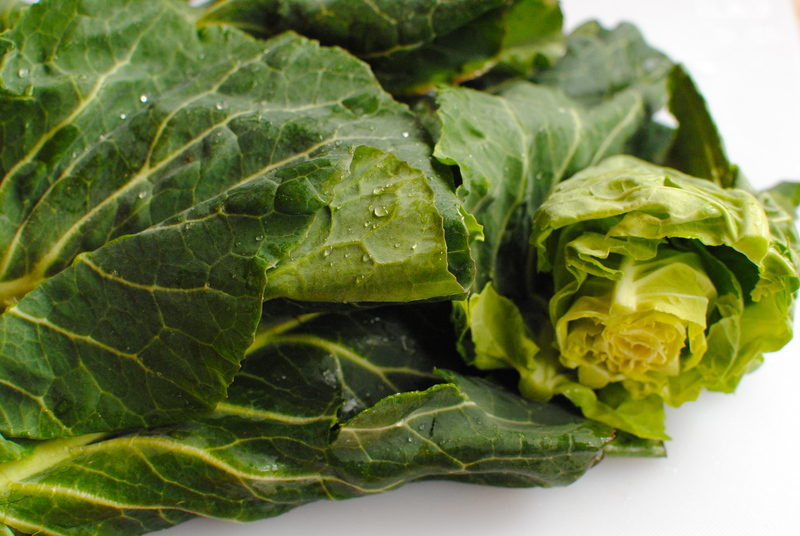 Great recipe, it is on the menu today as I happened to have spring greens. Just to clear up the ‘cast ne’er a clout ’til may be out’ refers to May blossom on Hawthorn bushes so keep yer vest on! Five layers today! Who do I sound like, I wonder?? Wow!! 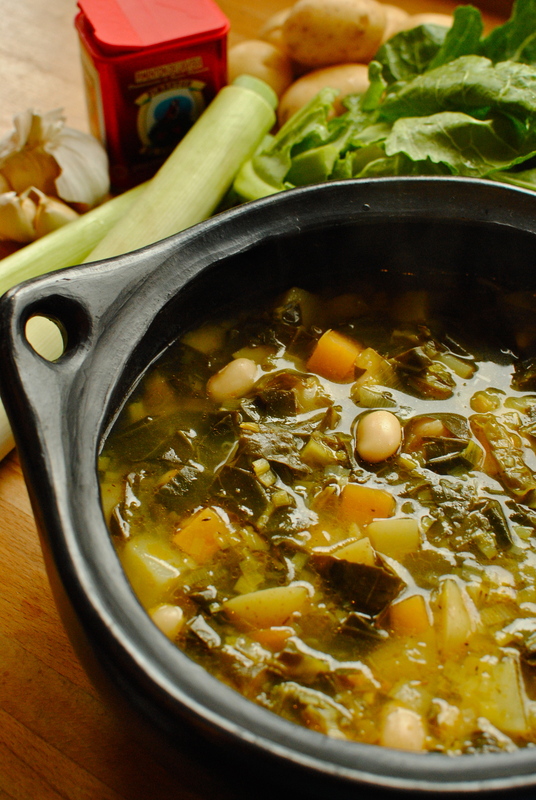 I made this exact same soup last week… I called it “Hearty kale and everything else soup.” I used the same seasonings and almost the same veggies and added garbanzo and cannellini beans!! It was the most delicious vegan-meaty dish I had.. All the double-excalmations show how excited I am that I matched to one of fav food blogs.. thanks! That is so weird!! It’s amazing how often that happens. Culinary ESP?? Yummy. It looks a lot like a soup that my Mom makes (and me too I suppose) called Gypsy Soup. I’ve heard of gypsy soup but didn’t know what it was. Now I know! What do you put in yours? It is a really flexible recipe, my Mom uses what ever vegetables she has around it is known for being a flexible soup, but I think the actual recipe is something like this: onion, squash, carrots, celery, garbanzo beans, broth, basil, kale/swish chard, turmeric, soy sauce, green pepper, I think she usually puts zucchini too, salt and pepper to taste. I think the main difference between it and the one you posted is the herbs and potatoes. I really fancy a bowl of that now! And I fancy that bowl as well, it’s gorgeous! Our weather has been beautiful here too up until this week. It always rains at Easter without fail. They celebrate Seman Santa here with processions and plays in the streets, hence the rain! I always feel so sorry for poor Jesus up on the cross in his loincloth in the rain but it is still a very prestigious role. I would love to get out there and take some photos for my blog but I’m looking at the steely grey sky and my thoughts turn to your soup instead!! Snap with the rainy procession. Growing up the passion play would almost always get rained on, in a place where it is sunny 350 days a year. Thanks for the kind comment about the soup. The bowl is actually a Terra Negra cooking pot from Columbia (bought in UK) – I love it too! Hope your weather cheers up! I was right there with you, Kellie, celebrating spring with your heavenly Mock Guac. My blood is still California-thin, though I’ve been in Montana for about 4 years by now. We had days in the 70s, encroaching on 80, last week, then yesterday on returning from a business trip to South Dakota, where it was also sunny and warm, we drove into snow. It snowed lightly all night, and this morning there was an inch of ice in the dogs’ water bowl. All traces of snow vanished with the rising of the sun, but there is definitely a chill in the air today. I don’t think it’s gotten above 45 F. I made vegetable stock the other day, so tonight it will be a compromise: soup, but a spring one – asparagus with some bright lemon. Have a lovely Easter! Sounds like your weather has been just as sporadic as ours! Cold and rainy yesterday and warm and sunny today…can’t complain though! 🙂 I will keep this lovely recipe closeby as we will probably still get a bit of cold weather before spring is done. I love how you remade a traditionally meat-laden dish into something so much healthier…and used meat as the garnish instead of as the base! London has had equally crazy weather – a few weeks ago I was sitting in the park in a T-shirt and now its back to my winter coat! Oh, and thanks for the tweet! I am usually too lazy to babysit a simmering fresh stock, but I will check out your recommendation. Thanks! me too – that’s the beauty of slow cooker stock – you can make a load of it and freeze it with minimal effort! Looks amazing. I love your vegan version. You can always add a little spicy sausage or chicken if you like – but it really looks like a perfect dish for our meatless Mondays. I am so happy to have come upon your blog, even though I am a year late on the posting. I am located on the Gulf Coast near Houston, Texas, with crazy weather, crazy politicians, and mosquitoes the size of small bats. 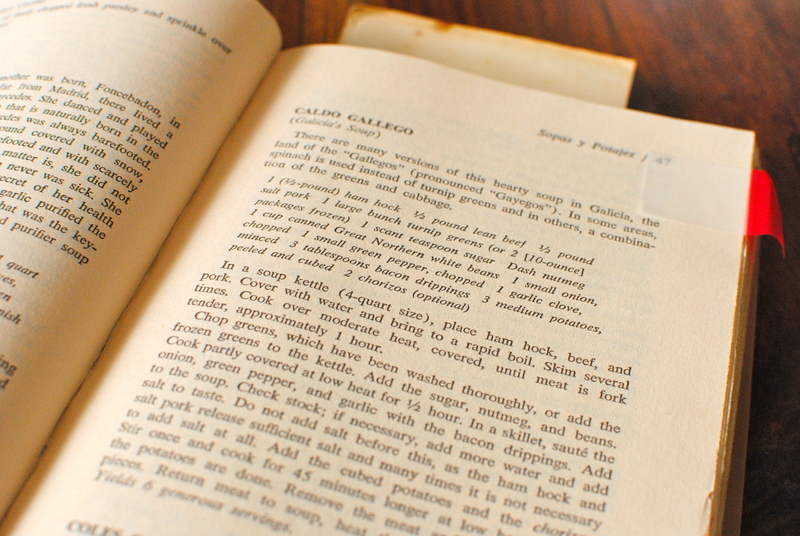 I was actually looking at an area restaurant’s menu and didn’t really know what Caldo Gallego was. I looked it up and chose your recipe simply because it looked so good. By Texas standards, yesterday was a blustery 61 degrees F. (Yes, I do not know what cold is according to my Illinois-bred husband.) Nevertheless, it put me in the mood for a hearty soup/stew. 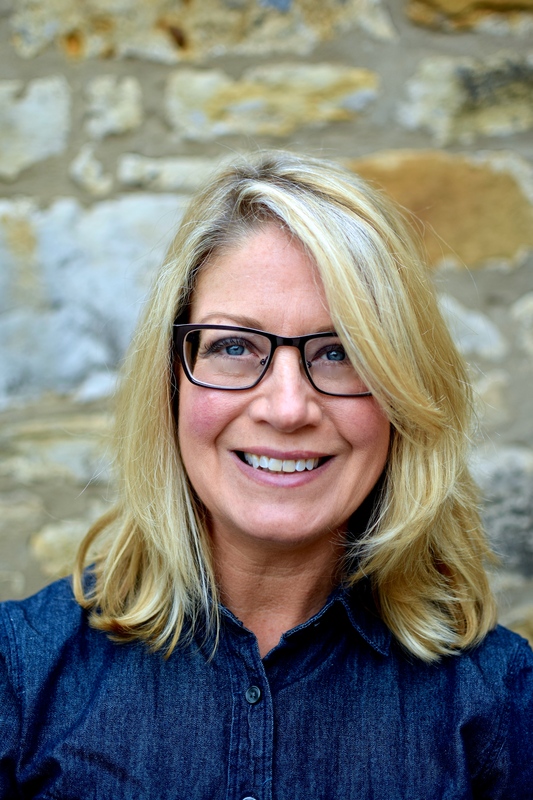 Your charming blog and yummy recipe caught my eye. I will be making it, but will use sweet potatoes instead of new due to issues with blood sugar. It was lovely meeting you through your blog. Hubby and I have considered blogging ourselves as we are now retired teachers. You seem to have so much fun with yours, I feel inspired.